The Bitterns in Rice project now has a great new website! between the rice farms in the Coleambally and Murrumbidgee Irrigation Areas, and the endangered Australasian Bittern or 'bunyip bird'. The Bitterns in Rice Project is about farming and wildlife conservation working together, and has been running since 2012. The project aims to uncover the well-guarded secrets of the globally endangered Australasian Bittern as welll as raise awareness of its plight. Through the project it is now known that there is a breeding population that descends on the rice crops of the Riverina each year, and in most years it numbers between 500 and 1000. This is remarkable, as there are only 1500-4000 individuals remaining in the world (populations exist in Australia, New Zealand and New Caledonia). Tracking has just commenced to discover where these bitterns disperse to after the rice has been harvested. The project is also working with rice farmers across the region to develop 'bittern-friendly' rice growing practices, to aid bitterns nesting in rice crops and increase the survival of young bitterns born and raised in the rice. 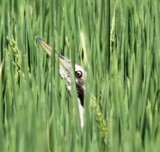 More information about how to grow bittern-friendly rice can be downloaded from the website.